The average attic renovation cost is $50,000-65,000 to convert it into a living space, such as a bedroom, office, or bathroom. While finishing an attic is one of the more expensive home improvement projects, it also boasts one of the highest ROI’s. According to the latest National Association of Realtors report, you may recoup up to 62% of your investment when you remodel an attic. Homeowners across the US report spending around $64,000 to turn their attic into a bedroom, or office with a bathroom. In terms of cost per square foot, you can expect to pay $192 per sq.ft. (materials and labor). Note that professional labor typically accounts for about 40% of the total. This means that you can save thousands of dollars, if you are able to DIY some of the work. To get a sense of how much this remodel can cost for your home, get 3-4 Free price quotes from local building contractors. As a rule of thumb, you should not invest more than 15% of your home’s value into converting your attic into a living space. Pro Tip: When planning your budget, its advisable to include an extra 10-15% for unforeseen expenses. Also, your contractor may need to pull special permits, which will also cost extra. It is best to discuss this with him before starting your project, so you are not slammed with bills you didn’t expect. Building a bathroom transforms your attic into a fully functional room that you can use as a bedroom or office. The average cost to add a bathroom is $8,000-12,000. Depending on the size of the space and the scope of work involved, a budget bathroom addition can cost as little as $5,000-6,000. A luxury bathroom that makes use of high-end materials and finishes costs $25,000-40,000. 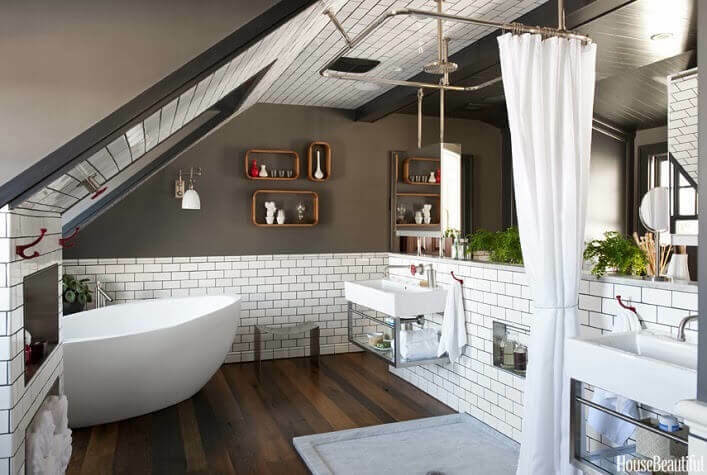 In recent years, a bathroom has become one of the most desirable features in a loft conversion. The increased comfort level and usability of the space are well worth it in the eyes of most homeowners. An extra bathroom also gives a major boost to your overall home value. With this project, plumbing is one of the greatest expenses. The total cost of plumbing will depend on how far away the new bathroom is located from the existing water and sewer lines. A fast and easy plumbing job may cost $1,400-1,600, while more complex installs can be as high as $3,000+. 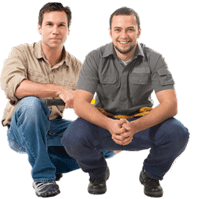 Licensed plumbers charge $45-65 per hour, depending on local labor rates. To maximize savings, try to situate your attic bathroom above an existing bathroom or kitchen. As mentioned earlier, transforming your old, dusty attic into a bedroom or playroom with a bathroom is one of the most popular remodels that many homeowners love to undertake. The expected returns are around 53-65% depending on the local market, overall house value and the quality of renovation. This means that if you spent $60,000 to completely remodel your attic, you will recoup $32,000 – 39,000. A renovated attic that has a bathroom gets higher overall returns compared to one without a bathroom. Adding even a half bath can make a huge difference in the resale value. On top of financial gains, a converted attic also boasts a high enjoyment rating. 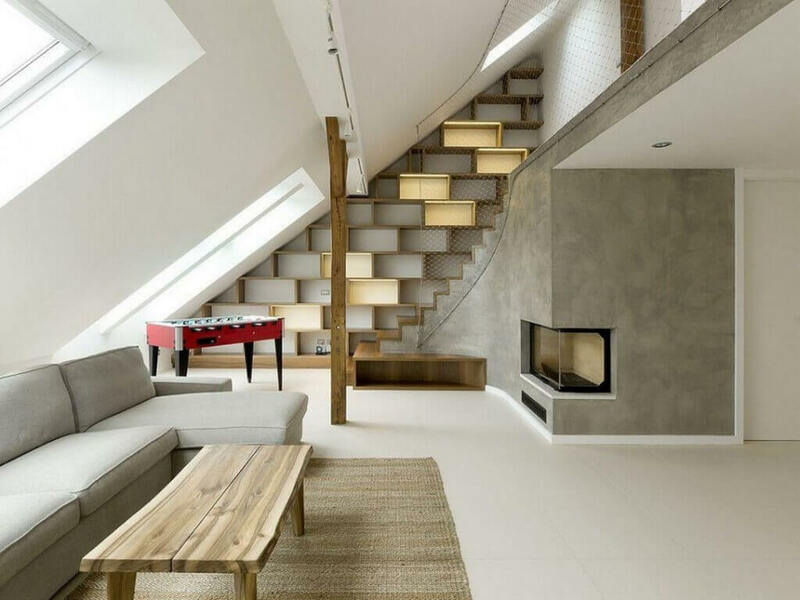 House Logic reports that homeowners who turn their attics into bedrooms, office, play or guest rooms, give this project a “joy score” of 9.4/10. 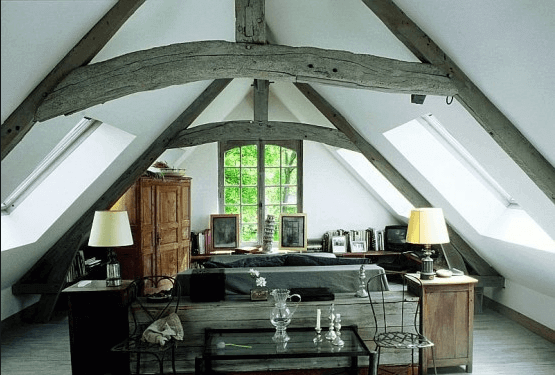 An attic room is a great way to add living space without having to extend the footprint of your home. For many people building an addition would be too costly, and often prohibited by zoning laws. Many attics are a hidden gem of an opportunity to gain extra usable space right inside the home. Even if you don’t need an extra bedroom or guestroom, you can use this space as a man cave, entertainment/game room to host adult or kid parties, or a work-out room. Size of the attic: local codes require that at least 50% of the finished attic space should be 7 feet tall. Additionally, the area needs to be at least 7 feet wide and have at least 70 sq.ft. of total floor space. 2 accessible emergency exists: having safe access is a must in an attic. The space will need to have a real stair case (not a ladder) and egress windows. Both will be used as an exit in case of an emergency. According to code, attic windows should constitute at least 8% of the total square footage, with 4% being the area that can open. Sound structural reinforcement: you need to ensure that your house structure can carry the extra load of a finished attic, which is significantly heavier than an unfinished space. Its best to hire a structural engineer to do an assessment of your home’s foundation and framing and tell you which if any reinforcements are needed. Proper permits: you should ask your town’s building inspector to come in and evaluate the space to figure out if an attic conversion complies will the local building codes and regulations. He needs to give his approval and issue all necessary permits before you can proceed with the renovation. Many homeowners are very tempted to skip the step of obtaining permits from the building inspector and just want to get started on the remodel. This is a really bad idea, because without the permits, you open yourself up to serious legal troubles if you ever try to sell your house. Moreover, if the inspector somehow finds out about the work being done in your home without a permit, he has the legal right to ask you to completely gut your finished project. A lot of people have lost thousands of dollars this way, so its best to err on the side of caution and do everything correctly. Because the roof is effectively the ceiling of your attic, it is the Number 1 priority to make it watertight. Otherwise, you will be dealing with constant leaks and mold issues in your new room, which will render the space basically useless. It is recommended to conduct a thorough roof inspection to make sure that it is in good condition. Expect to pay $250-350 for a professional contractor to come and evaluate your roof. If the roofer finds leaks, he will typically charge $550-700 to repair an asphalt shingles roof. Be prepared for the scenario where your old roof may need to be replaced before any renovation work can continue. Installing new asphalt shingles on a 1,600 sq.ft. roof costs $4,500-6,000 depending on the roof complexity, quality of the shingles and amount of labor involved. A more durable, and leak free material than composite shingles is metal roofing. While it costs $7,500 to 11,000 for the same 1,600 sq.ft. roof, you gain the benefit of never having to worry about leaks and other roof related problems for the next 50 years. Quality ventilation is key to ensure that excess moisture and heat can escape from the attic. Roof, gable, soffit ventilation or some combination of these may be required. Expect to spend $350 -1,200 for most jobs. The price may be closer to $3,000 if you will need new soffits and a ridge vent. If your roof has been leaking for some time, it is likely that mold issues developed in your attic. It is critical to do mold remediation before moving on to the finishing phase of the remodel. On average, getting rid of mold costs $1,500-3,000. However, if you have severe mold problems, it can end up being $7,000-10,000 to take care of it. Good attic insulation is a must. Without it, the room will be too hot in the summers and too cold in the winters. Be sure to get the right type of insulation with an R-value that will keep the space properly insulated in the particular climate you live in. The most common type of insulation is blown-in fiberglass or cellulose. It costs $600-1,800 for 2,000 sq.ft. The low-end pricing is for a DIY job, whereas high-end is for professional labor. Getting the right insulation may be a challenge, since the thickness of insulation lowers your headroom, and may lead to none-compliance with building code. To get the highest R-value combined with the thinnest insulation, most pros recommend putting in rigid foam insulation (PolyIso) together with batt insulation. Insulation alone is not going to solve temperature control issues. To make it comfortable all year around, you will need to put in an HVAC system (includes a heat pump, AC unit and duct work). Depending on the size of the space, you may need to run one or two ducts, which will impact the total price. Before you can move on to finishing work, you need to air seal the attic. The complexity of what you have there (ducts, house or bathroom fans, recessed lighting, ceiling fixtures, chimney through the attic, etc), will determine the cost. Expect to spend $350-1,500 on this part of the remodel. Egress windows are required to turn your attic into a bedroom compliant with building codes. In addition to providing an emergency exit in case of fire, windows will add more light and ventilation to the space. Be aware that the structural limitations of the roof will affect the size and placement of your windows. Putting in the windows is one of the most complex and expensive parts of the remodel. You may need to hire an architect to help plan the most effective dormer design and placement. Your contractor will also need to pull permits for this job. Depending on the number and size of the windows, roof steepness, quality of the materials and finishes, you will pay $3,000-18,000. Use our Windows Cost Calculator to get a more accurate estimate. To add extra natural lighting and design flair, you can install skylights. While the skylight itself is not very expensive, labor may be. Here again, the roof structure will determine the complexity of work required. Budget $700-3,500 per skylight, including materials and installation. For the attic to be legally livable, there needs to be proper stairway access from the floor below. The most budget friendly option is a straight run staircase, but the downside is that it takes up the most space (around 40 sq.ft). Depending on the materials and finishes you choose (newel posts, hardware, etc), expect to spend $550-2,800. A more expensive, but space-saving stair design is the spiral. A wood or metal-wood staircase kit ranges in price from $2,000 to 6,000. Professional installation of a new staircase costs $580-1,300. The cost to install electric wiring, outlets and lighting to code will depend on the amount of work required. Licensed electricians charge $65-85/hr. On average, homeowners report spending $2,000-3,000 to complete all electric work. This estimate will be higher if you are planning to build a home theater, or any other set up that requires more advanced lighting. 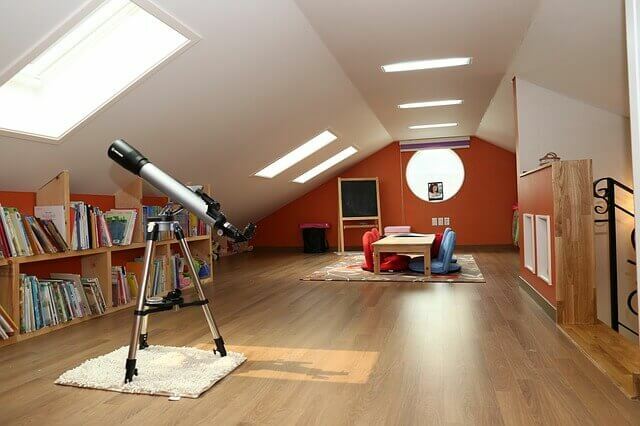 A good, soundproof floor is an important element of a finished attic. You don’t want the people downstairs to hear annoying sounds of a squeaking floor coming from upstairs. The most popular and budget friendly options are laminate tile and carpet. Also, depending on the structure of your home and the added weight of the finished attic, you may need to reinforce the floor joists (this will help with sound proofing as well). Many unfinished attics have joists that are too far apart, and would not work for a living space. Putting in a new floor should be one of the last tasks in the entire attic renovation. It should be tackled only after you have completed all electrical and ventilation work. If you have visible joists on the floor, you will first need to build a subfloor before moving on to the finishing material. On average, installing a plywood subfloor in a 300 sq.ft. room costs $500-800. New flooring costs $3-7 per square foot depending on the size of the room, type of material and job complexity. Typically, you will pay $1,300-2,600 for carpet and $2,400-3,500 for laminate tile. One of the final steps is to finish the walls and ceiling. This includes putting in drywall, painting the walls and ceiling, installing trim and moldings, as well as other finishing touches. Depending on the size of the space and quality of finish you are looking for, your cost to finish drywall and paint the walls will be $900-2,800. Since the space is small, its best to use warm off-white tones or other very light colors on the walls. An all white room will instantly feel larger and airier. If you like bright colors, you can paint one of the small walls with a brighter hue, while keeping the rest of the space light. If you are after a country-style or rustic feel, consider natural wood or beadboard paneling for the ceiling instead of drywall and paint. The same paneling can also be used for the walls. Really nice article on pricing! Super helpful. Very accurate up to date information. Thank you. Ill be using your pages alot. How is it financially viable if you are spending 60k and recouping only 35-40? Do you mean on top of the cost? What a trove of great information! Fantastic, THANK YOU! !